The two-humped Bactrian camel furnishes the world with camel hair. Domestic Bactrian camels are an ancient crossbreed of the one-humped Camelus dromedarius of Syria and the two-humped, Camelus bactranus of Asia. The two camels were cross-bred long ago to combine the heat resistance of the onehumped camel's fiber with the superior resistance to cold of the two-humped camel's fiber. China produces the majority of the world's supply of camel hair, with the provinces of Xinjian and Inner Mongolia providing the most. The country of Mongolia is also a major supplier. Each camel produces about five pounds of hair fiber per year. The fiber is double coated, meaning that it has one layer of long, coarse guard hairs, and an undercoat of soft, fine, downy fiber. Camel hair is harvested in the spring of each year by shearing or by collecting the hair as it sheds naturally from the animals during their six-to eight-week molting season in the spring. In nomadic societies of years' past, a person called a "trailer" followed the camel caravan, collecting hair tufts as they dropped on the trail during the day and from the area where the camels had bedded down for the night. By the early 2000s shearing was done to increase the efficiency of harvest. The hair over the humps is generally left unshorn to increase the camel's disease resistance over the summer months. The camel hair is roughly graded after it is shorn, then it is brought to herdsmen's cooperatives and central distribution facilities for further sorting and grading. Only about 30 percent of the raw fiber is suitable for apparel products. Camel hair's three grades are determined by the color and fineness of the fiber. The highest grade is reserved for camel hair that is light tan in color and is fine and soft. This top grade fiber is obtained from the camel's undercoat and is woven into the highest quality fabrics with the softest feel and most supple drape. The second grade of camel hair fiber is longer and coarser than the first. The consumer can recognize fabric using the second grade of camel hair by its rougher feel and by the fact that it is usually blended with sheep's wool that has been dyed to match the camel color. A third grade is for hair fibers that are quite coarse and long, and are tan to brownish-black in color. This lowest grade of fibers is used within interlinings and interfacing in apparel where the fabrics are not seen, but help to add stiffness to the garments. It is also found in carpets and other textiles where lightness, strength, and stiffness are desired. Under a microscope, camel's hair appears similar to wool fiber in that it is covered with fine scales. The fibers have a medulla, a hollow, air-filled matrix in the center of the fiber that makes the fiber an excellent insulator. Camel hair fabric is most often seen in its natural tan color. When the fiber is dyed, it is generally navy blue, red, or black. 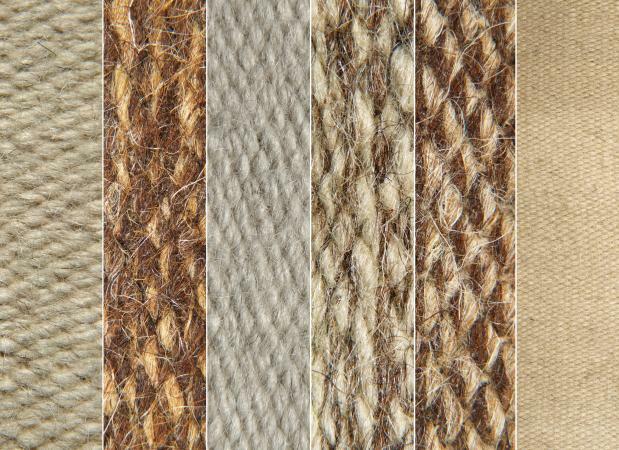 Camel hair fabric is most often used in coats and jackets for fall and winter garments that have a brushed surface. Camel hair gives fabric warmth without weight and is especially soft and luxurious when the finest of fibers are used. Sclomm, Boris. "Gaining an Insight into Camel-Hair Production." Wool Record (November 1985): 25, 29. Petrie, O. J. Harvesting of Textile Animal Fibers: FAO Agricultural Service Bulletin No. 122. Food and Agricultural Organization of the United Nations, Rome, 1995. Available from http://www.fao.org/docrep/v93843/v9384e00.htm .